Greetings producers, sound designers, “beatmakers”, musicians. Hope your day is going well. Last night I took some time to again categorize samples from sample CDs I get from the magazines Future Music and Computer Music. Some of you have read my previous blogpost on how I organize my sample library by genre, loops (bpm), instrument, etc…on two external drives – one connected to my studio computer and the other 750GB portable drive I pack with my Macbook for mobile production. During last night’s session, I was auditioning some soul and funk drum loops and hits. The loops folder included the full mix loop, the individual drum loop (with/without kick and snare) and a folder of individual hits. As I listened to each loop, I decided whether it would be something I’d be prone to want to use for a future track or just leave on the DVD. While all the loops were excellently recorded, I thought back my days of programming drum machines I owned for the drum and percussion tracks I needed. This was, of course, before the advent of samplers. Though I could take the individual hits and load them into my DAW’s (Logic Pro’s EXS24 or Ultrabeat) sampler and map them across the keyboard *OR* load them into my MPC, I wondered if using loops AS IS, was just the lazy man’s approach to music production. 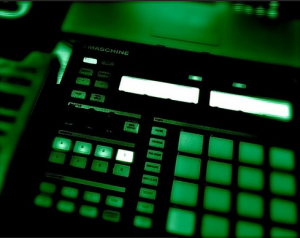 While I’m not here to debate whether it is or not (nor would I even spend the energy to do so), I thought that because of how I had to take a beat in my head and translate it to the drum machine of choice at the time. Of course, the drum machine was dependent upon the quality of the PCM samples (or whatever format it used), so drum hit flexibility was no where near along the lines of samplers – and – in the minimal sense, assigning individual drum samples across your keyboard is pretty much the same thing, there is something, to me, about taking a loop and using it as is. Easy, yes…I’ve done it a few times, but is it really lazy? Interestingly enough I was thinking how I can employ samples from the really popular genre of dubstep into the house, soul/RnB, instrumental jazzy hip hop, and chillout/downtempo tracks I like to write and produce. I like the substance of the quote above – it always reminds me that in the plethora of samples and construction kits available (free and otherwise), use creativity and variation employing them. Not to say, you wont come up with a smash hit like Rihanna’s “Umbrella” (drum loop taken straight from Apple’s Garageband/Logic loops library and slowed down a little), if you use a straight loop, but …u follow me.